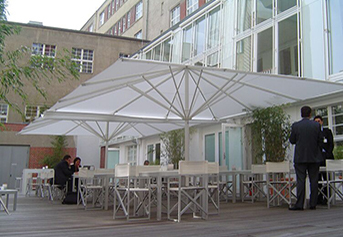 Especially designed to meet the requirements of outdoor catering, this sunshade concept provides an exclusive atmosphere in large areas. Its clear design is unique and lends its very own unmistakable charm to any outside area. The Albatros umbrella stand out by virtue of their maintenance free drive and particularly robust construction. 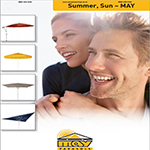 The largest umbrella that May make, the Albatros is designed specifically for service industries and commercial use, with it’s large size allowing for maximum coverage and minimal obstructive poles. They are available with lights and heaters, allowing you and your customers or guests to enjoy your outdoor space further into the evening and even during the colder months. This makes it an excellent solution when planning to optimise your outdoor space. 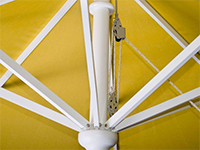 The Albatros is a large opening umbrella capable of creating a space of up to 78 m², and is opened and closed with a smooth-running, removable stainless steel crank. The reliable drive-system with accurate integrated bevel gears guarantees effortless handling, even after years of usage. Electric drive on request. 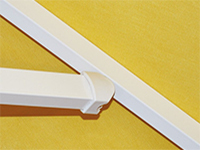 The poles of our sunshades are all made of high-quality alloyed, extruded aluminium profiles. Frame surfaces are powder-coated, highly impact proof and available in white RAL 9010. 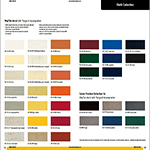 Special colours are available on request. All parts are completely maintenance free. Discs with support struts and spokes. In order to prevent the spokes from getting twisted, the lower die-cast disc is firmly welded to the support pole. For us perfection in workmanship is an absolute must. Therefore, all moving axes are fitted with easily removable bolts. This extravagant technology ensures maximum stability and durability as well as easy execution of repairs. Not only is it elegant and graceful, but it can be screwed off. and is in a colour to match the framework. 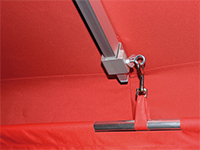 Due to a special self-tensioning telescopic spring system the awning remains perfectly taut, even after years of usage. 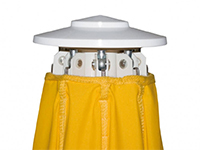 The canopy covering can easily and quickly be changed by means of as practical hooking system. 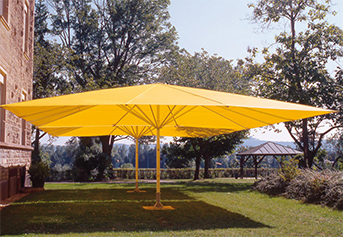 The protective cover provided can easily be fitted over the shade during bad weather.